New York City is a financial, social, and cultural capital of the world. With millions of residents from all walks of life, it makes perfect sense that breweries and brewpubs in NYC and New York State reflect multiple cultures and styles. With famous local breweries, like The Brooklyn Brewery and the Flying Bison Brewing Company, to well-known craft beer companies, like Brewery Ommegang and Southern Tier Brewing Company, New York City and State are maintaining and building their reputation in the national brewery community. While New York City and state are an excellent place to find high-quality beer, it’s real secret is the number of small-batch craft breweries that create beer great enough to be featured in our exclusive Rare Beer Club®! We’ve been had the chance to feature several NYC breweries in our club over the years, including one of our favorites, the Broken Bow Brewery Blended Barrel-Aged Barley Wine. Brewed in Tuckahoe, NY, this blended barrel-aged barley wine was a truly memorable bottle and a big hit with members. We invite you to look for the best breweries and brewpubs in New York using our list below. 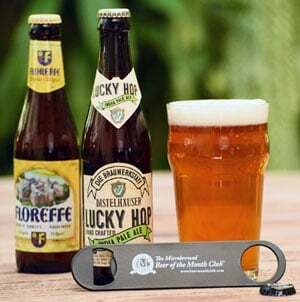 If you live in New York and want a beer club that’ll allow you to sample your state’s, and the country’s, best beers, then consider buying or gifting a membership to The Microbrewed Beer of the Month Club. There’s no better gift than beer, and each box you receive will help prove that point over and over again.